BELLEVUE, Wash. , February 08 /Businesswire/ - Symetra, a national provider of employee benefits, annuities and life insurance, has committed a second $100,000 donation to The Sophia Way, a Bellevue, Washington-based nonprofit dedicated to helping end homelessness for single adult women in King County. Like the company’s June 2018 gift, the funding will allow the Eastside Emergency Shelter for Women to remain open from mid-May through October. Symetra CEO Margaret Meister announced the donation last night during her keynote remarks at the Bellevue Downtown Association’s 45th Annual Celebration at Meydenbauer Center. Currently based at an interim location at Lakeside Christian Church in Kirkland, the shelter will ultimately become part of a new, permanent facility in Kirkland for women and families with children that is scheduled for groundbreaking this spring. Symetra’s relationship with the Sophia Way began in 2009, when the organization operated its day center at the Bellevue First Congregational Church’s former location across the street from Symetra headquarters at NE 8th and 108th Avenue NE. The company’s support has expanded over the years to include sponsorship of The Sophia Way’s annual fundraising luncheon event and volunteer support through the Symetra Week of Service. Last summer, Symetra employee-volunteer teams helped prepare the interim shelter location for its June re-opening by cleaning the facility and laundering bedding. Symetra Financial Corporation is a diversified financial services company based in Bellevue, Washington. In business since 1957, Symetra provides employee benefits, annuities and life insurance through a national network of benefit consultants, financial institutions, and independent agents and advisors. For more information, visit www.symetra.com. The Sophia Way is a vital Eastside program dedicated to supporting single adult women experiencing homelessness in King County move into housing. 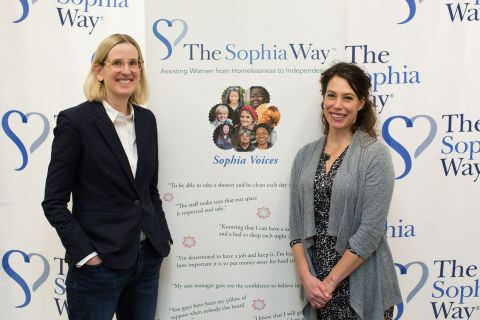 Founded in 2008 to address the lack of resources and services for the growing population of women seeking shelter and housing, The Sophia Way has served more than 4,000 women with a comprehensive array of support, the most important of which is help in exiting homelessness. The organization believes every woman is housing ready and works with the evidence-based Housing First approach to ensure the success of housing many more women. For more information, visit https://sophiaway.org.